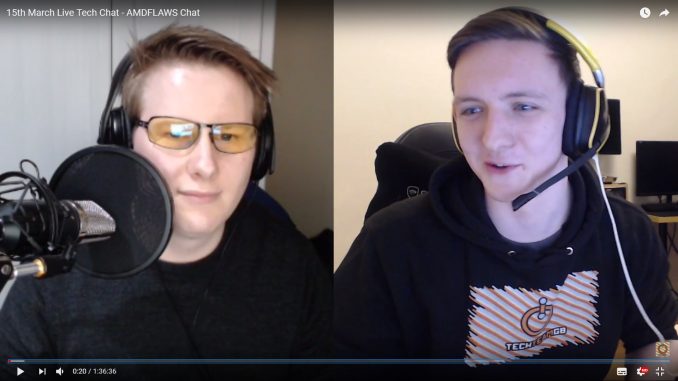 After our analysis about the vulnerability disclosures this week on AnandTech, and continuing discussions on Twitter, TechTeamGB, a Great Britain based Youtube technology channel, invited Senior Editor Ian Cutress on the Thursday show to discuss the recent news surrounding the AMDFlaws website, the ramifications of the announcement, the company behind the announcement, and what it means to the community at large. Through the 96 minute discussion, Ian vocalised a lot of what has been covered on AnandTech already, and discussed some of the more esoteric claims in the wild that may or may not have elements of truth in them. This show was broadcast before posting our interesting call with CTS-Labs, the company behind the vulnerability disclosure, but has a number of snippets that are mirrored in that article. A small Q&A from the TechTeamGB audience happens at the end of the show. The show is hosted by TechTeamGB Host, Andrew McDonald. If you prefer your content in audio and video form, here it is.